Get Grinds is a very unique chewing tobacco alternative or maybe it should be marketed as a new form of energy in the crowded Energy Boosting Market. The Get Grinds Coffee Pouches have the same look as the traditional tobacco chewing products on the market but contain flavored coffee grounds instead. A 100% Nicotine Free Alternative sounds like a Great Idea. Not that an excessive amount of caffeine from the coffee grounds would be good for you, but a caffeine habit is much better than a nicotine addiction. Actually, one Get Grinds pouch also known as fake chew contains the equivalent of only 1/4 cup of coffee. It's not just caffeine that gives you the added boost but other energy boosting ingredients as well. they've essentially married two separate product's in a rather unique form. 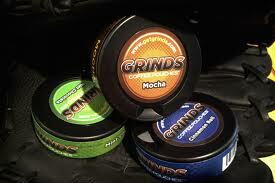 The Get Grinds Coffee Pouches is a perfect alternative to chewing tobacco with an added boost at the same time. Another unique advantage to the get Grinds Coffee Pouches especially if you already chew tobacco, is you do not need to spit. In Fact, it's encouraged not to spit because you gain more of the energy boosting ingredients by swallowing. No Kidding! You are essentially brewing the flavored coffee in your mouth. The only thing you need to spit out is the pouch when you're done. Will the Sharks get into the Smokeless Tobacco/ Energy Boosting Business? It sure seems like a good business idea to me. Especially the concept of joining to separate products and creating a Brand New Market. Personally, I've never heard of chewing coffee grounds as an alternative to chewing tobacco, but a quick search revealed there's already competition starting to sprout up. Most of the Sharks like unique patented product's that limit the competition, and this may pose a problem. On the other hand, this Brand as THE alternative to chewing tobacco and also as an alternative for energy drinks could have an enormous amount of potential. To help build this Brand as the alternative to chewing tobacco, they went to the sport most publicizes this not so good habit, the Major League Baseball Teams. The Get Grinds Tobacco is now available in 20 of the 30 teams clubhouses. Yes, that sounds like an excellent recommendation and one you can build a Brand around. Just like anyone that's addicted to anything whether it's caffeine, nicotine or just jumping out of a perfectly good airplane, they'll always come back for more. It's also a proven fact when you stop one addiction, it's usually replaced with another one. Replacing chewing tobacco that I personally think tastes like crap with flavored coffee grinds that not only smell good but actually tastes good, could quickly become a great substitute. A product they 'll continue to keep buying for years to come. Get Addicted to the "Good Stuff" order a sample pack today! This stuff actually works and got me to quit chewing tobacco after 14 years. I Highly Recommend You At Least Try It. Agreed^^ These baseball players have a head on their shoulders no doubt about it. I recommend this product as a Vermont college student who was addicted to tobacco. I've been using these for the past two years. A great product and an awesome business to support. Enjoy! why not make your own by using empty tea bag and ground coffee? Ordered 1 batch came in in good timing. Ordered a larger 2nd batch because it is helping me not use tobacco. Only one problem. They took the payment from my card a couple weeks ago, but still have not gotten a tracking number and now I am completely out. Trying to hold off on going back to my bad habit. They need to turn and burn orders much faster. 4 weeks now still no tracking number. Have gone back to buying tobacco. Your patent does not appear to apply here. Your claims require "rapidly-dissolving water-soluble film" and this does not dissolve. My two cents. Hey, i just put in my first order (4/30/2013), and now im worried about shipping time because I'm actually moving out in a few weeks. If i'd known that shipping would take WEEKS, i wouldnt have ordered. My email said 3-5 days. Anyone experiencing shipping problems still? I ordered some on Monday and got them on Friday. Use amazon to order these. If you have prime it's at your door in 2 days. If you don't then it's around 5. Plus 6 cans for 35 bucks is a little high....but it works wonders for those of us in the military!